Rogue One Opens to $290.5 Million at the Global Box Office! Rogue One: A Star Wars Story opened globally this weekend to an impressive $290.5 million, opening at #1 in all markets across the globe. The domestic estimated opening weekend of $155 million is the second-highest December opening (behind only Star Wars: The Force Awakens) by a wide margin. Internationally, Rogue One posted the fourth-highest December opening of all-time with 135.5 million from 52 territories. The film had the best opening weekend of 2016 in many European markets, including France, Germany, Spain and the UK/Ireland. 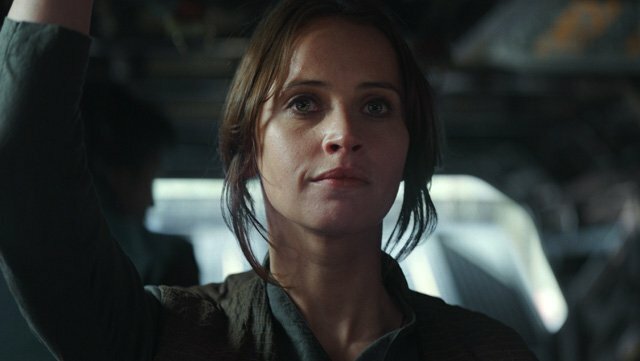 Rogue One received a strong A CinemaScore from audiences. Rogue One earned $29.2 million from 708 IMAX screens worldwide. This is the second-highest December IMAX opening in history, behind last year’s Star Wars: The Force Awakens, as well as a top five all-time global IMAX opening weekend. In North America, Rogue One earned $19 million from IMAX, becoming the first movie released on over 400 domestic IMAX screens. Internationally, Rogue One earned $10.2 million in IMAX, which marks the second-highest December IMAX opening ever for internationally (behind Star Wars: The Force Awakens), and biggest IMAX opening ever in Japan, Denmark, and Belgium. Directed by Gareth Edwards, Rogue One: A Star Wars Story stars Felicity Jones, Diego Luna, Ben Mendelsohn, Donnie Yen, Mads Mikkelsen, Alan Tudyk, Riz Ahmed, Jiang Wen, and Forest Whitaker. In North America, Walt Disney Animation Studios’ Moana dropped a spot to second place with $11.7 million for a total of $161.9 million after four weeks. Internationally, the animated film added $15.5 million to take its overseas total to $118.4 million. Worldwide, Moana is now up to $280.3 million. Moana was directed by John Musker and Ron Clements. The film features the voices of Auli’i Cravalho, Dwayne Johnson, Jemaine Clement, Rachel House, Temuera Morrison, Nicole Scherzinger, and Alan Tudyk. Paramount‘s R-rated comedy Office Christmas Party also dropped a spot to third and brought in $8.5 million its second weekend for a total of $31.5 million. Starring Jennifer Aniston, Jason Bateman, Vanessa Bayer, Jillian Bell, Jamie Chung, Rob Corddry, Abbey Lee, Kate McKinnon, T.J. Miller, Olivia Munn, Karan Soni, Courtney B. Vance, and Matt Walsh, Office Christmas Party was made for $45 million. New Line’s Collateral Beauty debuted in the fourth spot with just $7 million from 3,028 theaters. Collateral Beauty also earned an estimated $4.6 million internationally this weekend from 16 markets. Made for $36 million and receiving an A- CinemaScore, the film stars Will Smith, Edward Norton, Keira Knightley, Michael Pena, Noamie Harris, Jacob Latimore, Kate Winslet and Helen Mirren. Warner Bros. Pictures’ Fantastic Beast and Where To Find Them rounded out the top five domestically, grossing $5 million its fifth weekend for a total of $207.6 million. Internationally, Fantastic Beasts took in another $14.5 million to bring its overseas total to $509.8 million and worldwide sum to $717.5 million. Directed by David Yates from a script by J.K. Rowling, Fantastic Beasts cost $180 million to make and stars Eddie Redmayne, Katherine Waterston, Dan Fogler, Alison Sudol, Ezra Miller, Samantha Morton, Jon Voight, Ron Perlman, Carmen Ejogo, Jenn Murray, Faith Wood-Blagrove, Colin Farrell, and Zoe Kravitz. Kenneth Lonergan’s Manchester by the Sea (Amazon, Roadside) expanded wide into 1,208 theaters where it earned $4.1 million in sixth place. Starring Casey Affleck, Michelle Williams, Kyle Chandler, and Lucas Hedges, the film has earned $14 million after five weeks in theaters. In seventh, Damien Chazelle’s La La Land (Lionsgate) expanded into 200 theaters and earned $4 million its second weekend, an average of $20,100 per theater. The movie has now earned $5.3 million. La La Land, starring Ryan Gosling and Emma Stone, will expand further on December 25. It was made for $30 million. Denzel Washington’s Fences (Paramount), meanwhile, earned $128,000 from just four theaters, an average of $32,000 per location. The film, starring Washington and Viola Davis, cost $24 million to make. Although the film doesn’t open in North America until February 17, 2017, Universal and Legendary’s The Great Wall opened in China this weekend with $66 million. Directed by Zhang Yimou, the action adventure stars Matt Damon, Jing Tian, Pedro Pascal, Willem Dafoe, Zhang Hanyu, Eddie Peng, Lu Han, Kenny Lin, Wang Junkai, Zheng Kai, Cheney Chen, Huang Xuan, and Andy Lau.